Producing some of the most brilliant fall color, the red maple (Acer rubrum) is a large deciduous tree growing in the cool northern areas of the United States. Red maple most often grows 40 to 70 feet tall but can reach more than 100 feet in an ideal growing site. It grows in full sun in moist bottomlands as well as along streams and rivers. It may also be tapped for syrup production, but it produces far less than the sugar maple (Acer saccharum). Red maple does not do well as a grafted culitvar; new trees true to type are cultivated by stem cuttings or tissue culture. 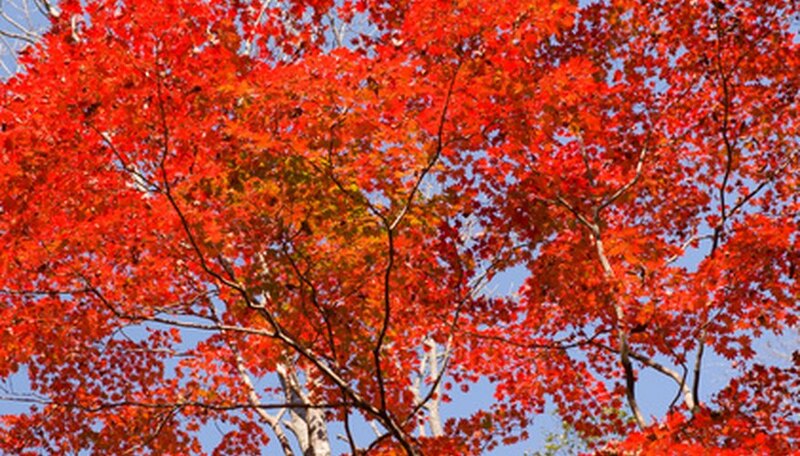 With a rounded habit while young, autumn flame (Acer rubrum autumn flame) develops a more spreading canopy as it ages. It grows 40 to 60 feet tall, spreading an equal distance, with smaller leaves than most varieties. It is one of the first trees to show color in fall. Autumn flame grows best in full sun in moist areas. It is slightly less hardy than most red maple cultivars, showing reliable winter hardiness in USDA zones 4 through 8. Columnare (Acer rubrum columnare) produces red flowers before it leafs out in spring. Its small twigs and buds are reddish in color and has dependable orangish-red foliage in fall. Columnar grows to about 60 feet high with an upright growth habit and is a slow-growing maple variety that makes an excellent shade or street tree. It will grow in partial shade but grows best in full sun. Columnar is hardy in USDA zones 3 through 9. A maple variety with a pyramidal shape, bowhall (Acer rubrum bowhall) grows to about 50 feet high and spreads to about 25 feet wide. It has yellow-orange fall color with red highlights. Bowhall grows well in damp places on all types of soil. The bark is thin and can be damaged easily by mowers. Bowhall maple must be pruned to develop a strong structure and eliminate branches growing out of the central leader at shallow angles. It is not bothered by pests or diseases and is hardy in USDA zones 3 through 8.